June | 2014 | Peace.Sweat.Love. 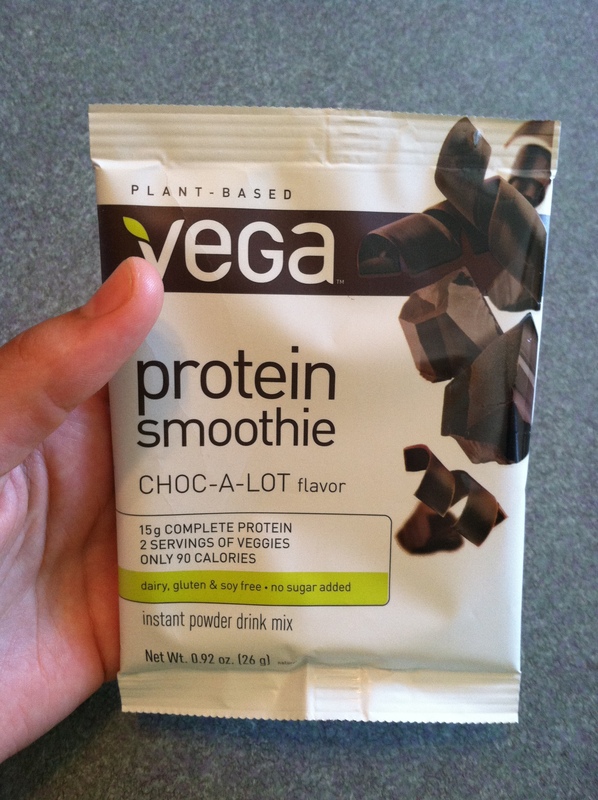 Week recap… plus Vega protein powder and Blender Bottle review! I hope that you are all resting (or already in bed!) preparing for the start of another week. I know that even though I woke up quite late this morning (I think I slept 11 hours – I guess I needed that sleep! ), I am going to be ready for bed soon. But before that, I think I owe my followers a review of this week and a look into the little things I’ve been up to in my spare time! As you may recall, I have started another summer job at a local seafood restaurant in my attempt to save at least some money before the poverty of law school. Last week was crazy – I was mildly sleep deprived and exhausted after working 5 nights in a row during my training! Plus, I had the awesomely fun 5k foam fest last Saturday, which was amazing but unfortunately was stuck in the middle of a lot of work hours. Standing for 6 hours was not what I really wanted to do after that race, let me tell you! 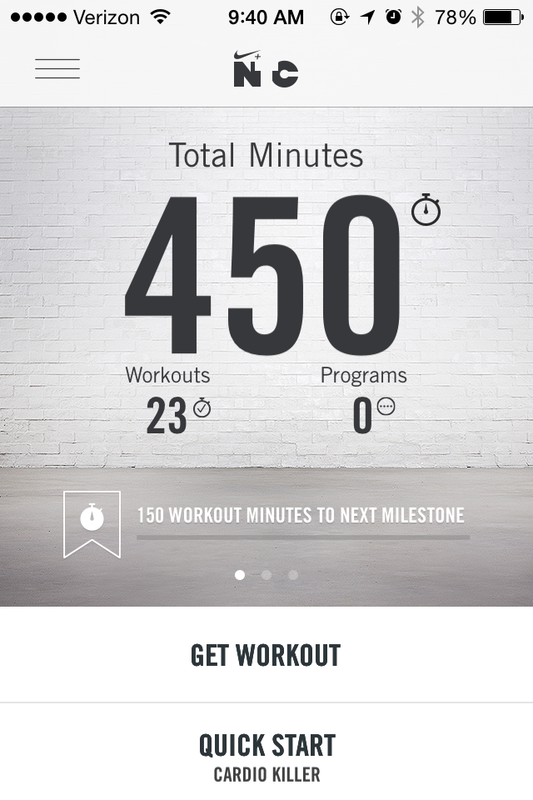 So, looking at my Tough Mudder training schedule, I realized that I have wrapped up my fourth week and am now starting on my fifth week of training – exciting! Today I tried out a different local yoga studio. Very, very gentle class. Though I typically prefer something more athletic, I admit this was good for me to stretch everything out, especially as I like to do my long runs on Saturday. Yesterday’s run had to be cut short – a little over 5 miles instead of 6 – but I felt really great and could have kept going if not for time constraints, so I suppose that’s what really matters! It’s best if I go out in the morning on my long run, but I slept in late Saturday too, so that didn’t happen (I worked until 11:00-11:30 Friday, so I wasn’t going to push myself to get up – that doesn’t make sense to me). 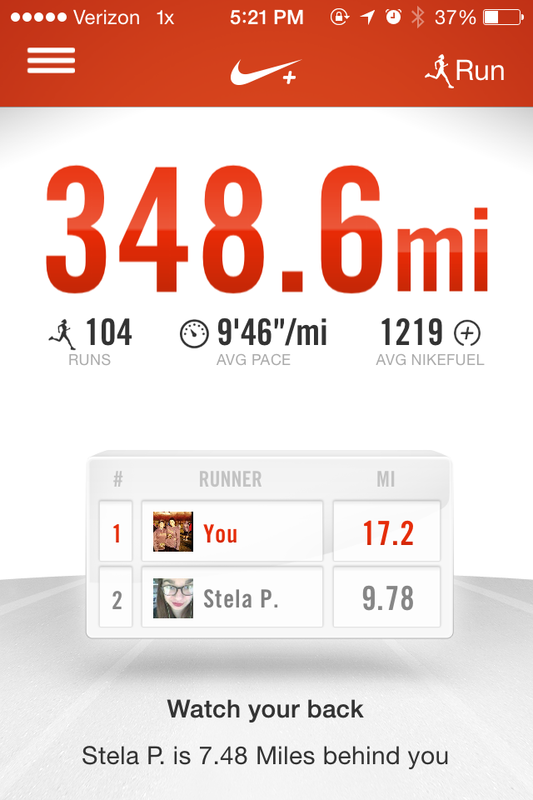 My average pace isn’t super fast, sure, but it’s way better than it was when I started running a year ago! That, and look at those miles add up! I feel pretty darn proud of that commitment, if I may say so myself. I’m no marathoner (yet?!) but I have consistently gone out there and run. 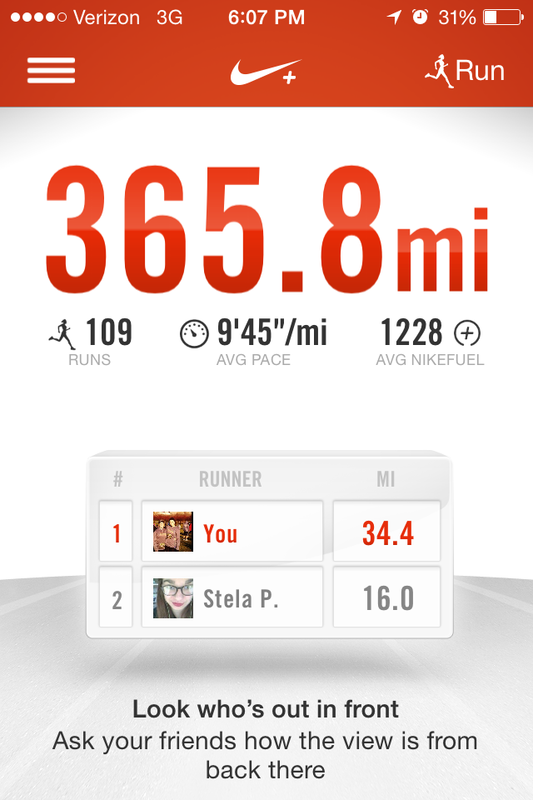 when I hit 500 miles I should celebrate… and when I hit 1,000 I will definitely celebrate! I also got in some hill workouts and interval workouts on the treadmill. Not as fun or refreshing as being outside, but I must admit I do prefer gym equipment for things like interval training. Hill workouts are easy on the treadmill, too. Recently I’ve been doing a hill workout I found in this article via Active.com. Definitely a killer, and definitely helped me during my the surprisingly hilly 5k Foam Fest! Because I’ve been on-the-go so much, I’ve also invested in some portable nutrition options. 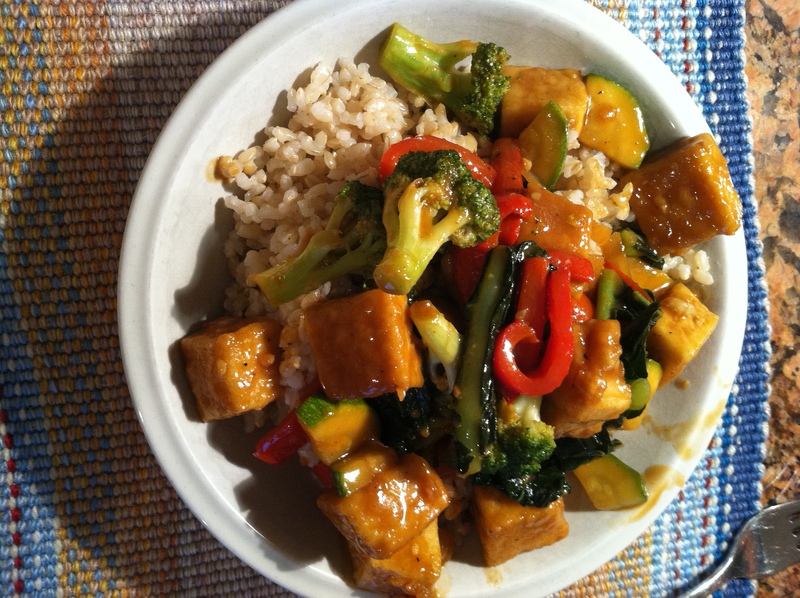 I might not be right, but I think a lot of other health-conscious people and definitely athletes tend to eat quite frequently. At work I can’t eat until the end of my shift, which means an absolute minimum of 5 to 6 hours of not eating. This certainly isn’t the end of the world, but if you eat lunch around 1 or even 2 and can’t eat again until 10 or even 11… you get my point. So to stay full and energized longer, I’ve been drinking my trusty fiber-filled chia seeds, and have stocked up on both Luna and Odwalla bars (some of my stand-bys!). 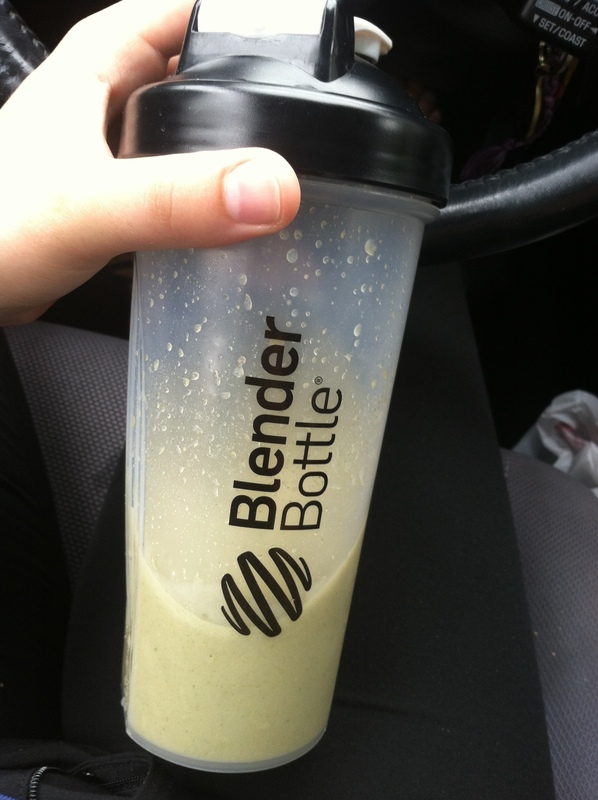 I found a Blender Bottle on clearance at TJMaxx recently, so obviously being the bargain lover I am picked it up when I had the chance. I figured re-integrating shakes into my diet was a good and almost inevitable thing. Well, knowing this, I decided to put it to the test after finding individual Vega protein powder packets on sale at Whole Foods. The first one I tried was chocolate flavored. I just mixed it with 8 oz. of water this time around. 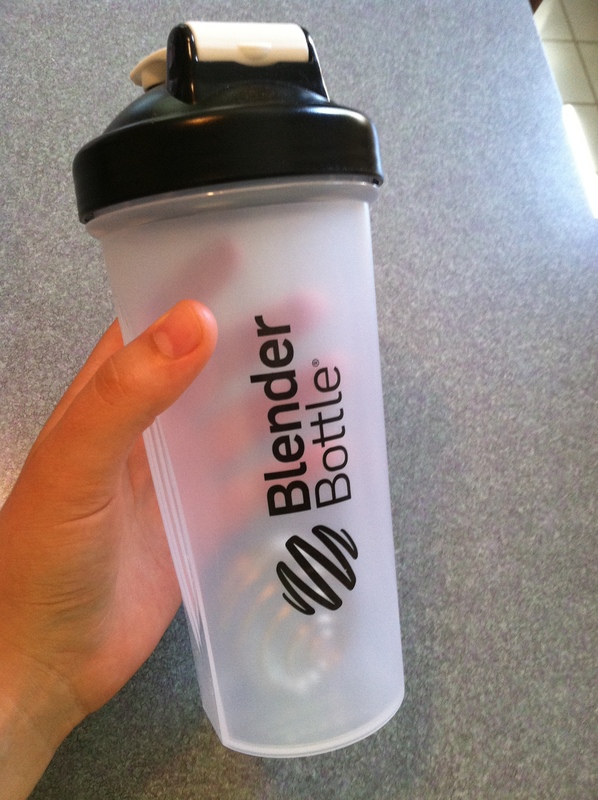 I was pretty impressed with how well the Blender Bottle truly blended everything – I was skeptical! And after years of being unable to ever truly mix in powders without the use of a blender, I was pleasantly surprised at how effective this simply little invention was! The shake, on the other hand, was less impressive to me. The chocolate was not really my thing. It was ok, but I didn’t love it. I had bought two other flavors – French Vanilla and “Au Naturel”. This time around, I mixed the vanilla flavor with rice milk instead of just water. This made it better, but it was still, well, it still tasted like a protein powder, for lack of a better phrase. It blended well but still wasn’t terribly appealing. With the only flavor left one I had intended on putting in a smoothie, I was certain that I would find myself simply disappointed with this particular Vega line. But, running late, I didn’t even have time to make a more elaborate smoothie. So I threw the unsweetened powder in the Blender Bottle with some rice milk and some honey. I didn’t expect it to be any good, but figured the honey and the rice milk would make it tolerable. Whoah. I was very surprised to find that I loved the taste of this shake! Which makes sense – stevia and other such sweeteners don’t taste great to me, and those are in the flavored powder varieties. The natural powder had a nice taste that mixed beautifully with the honey and the rice milk – it was just good! The natural powder also made a slightly greenish shake, something which I actually kind of liked – not that it changes the taste. I’m hoping to try the Vega One and maybe Vega Sport powders now, too. Perhaps I will finally find a protein powder that I can get along with! I’m also definitely going to be branching out and looking for different energy gels/chews as I continue my training. 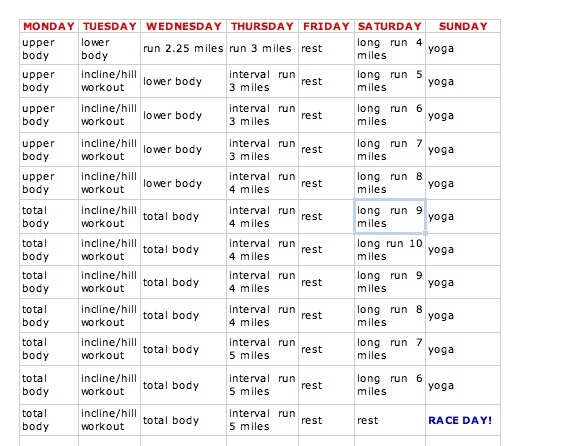 Anyone have any races or other events coming up? Protein powder recommendations? 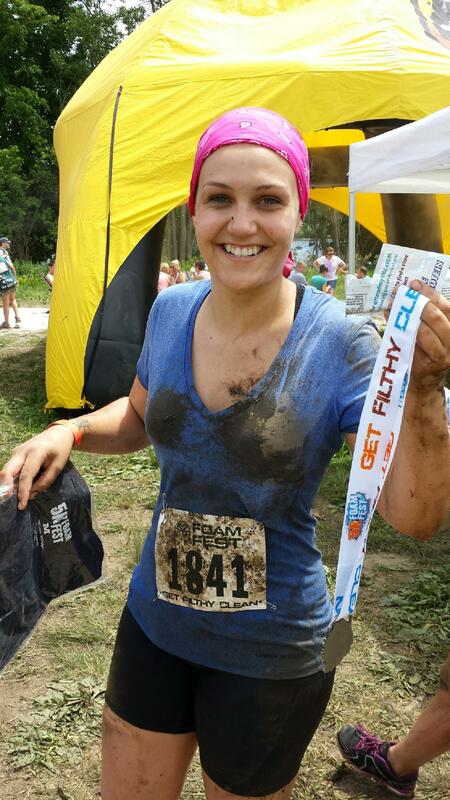 Remember, if you’re looking for a fun race, I highly recommend the 5k Foam Fest! Check out my pictures and earlier posts (including a recap!) for more info. If you do decide to sign up, remember to use my personal discount code “FF3316” to get $5 off the entry fee! This just in: official 5k Foam Fest photos! In a rush (I work tonight), but before I dash out I wanted to share some of my hilarious, muddy AND foamy official 5k Foam Fest photos! The least unflattering are all here (being covered in mud and foam, it turns out, isn’t super hot), but for vanity’s sake I left out the ones where I am making what appear to be angry turtle faces. What are you all up to this weekend? Any races coming up, runners and triathletes out there? 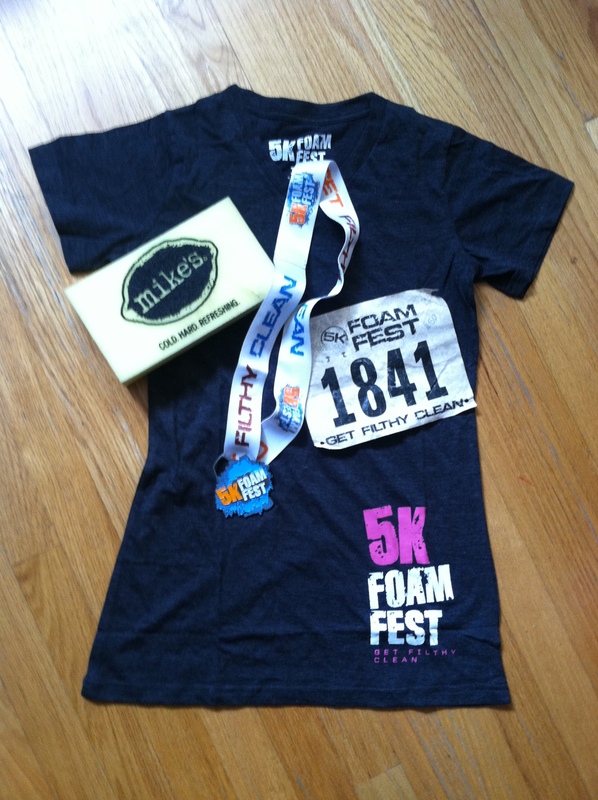 If you remember, I owe you all a review of my most recent race – the 5k Foam Fest! For those of you who do not know or do not recall, my Sweat Pink ambassador position with Fit Approach allowed me to join Foam Fanatics – a group that allowed me to participate in the race free of charge in exchange for help with publicity and ultimately a review of the race. I signed up for Foam Fanatics thinking, “Hey! 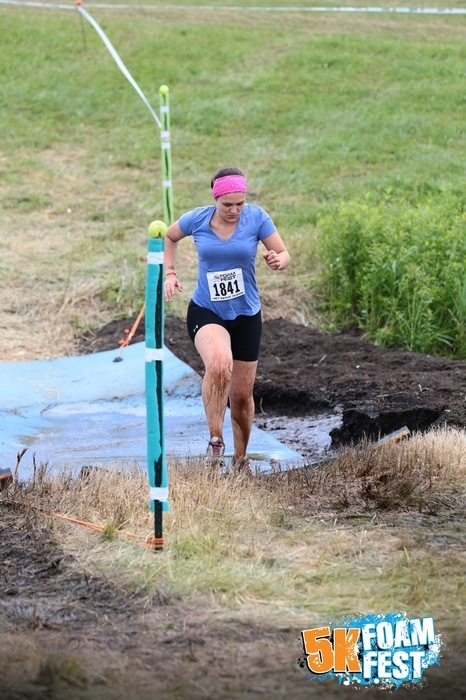 Free entry to a race that seems pretty cool, I’ll take it.” I also figured that it would be good prep for my Tough Mudder training – like a much less intense, cuter little cousin to the now infamous race. As a New Englander, I attended the Boston-area event. Unfortunately it was far away from where I live, but I understand that only so many spaces can hold such a large and elaborate event, and that it was meant to serve the greater New England area. The race was held at Kimball Farm in Haverhill, MA – something that I actually thought was a plus despite the distance for me personally. 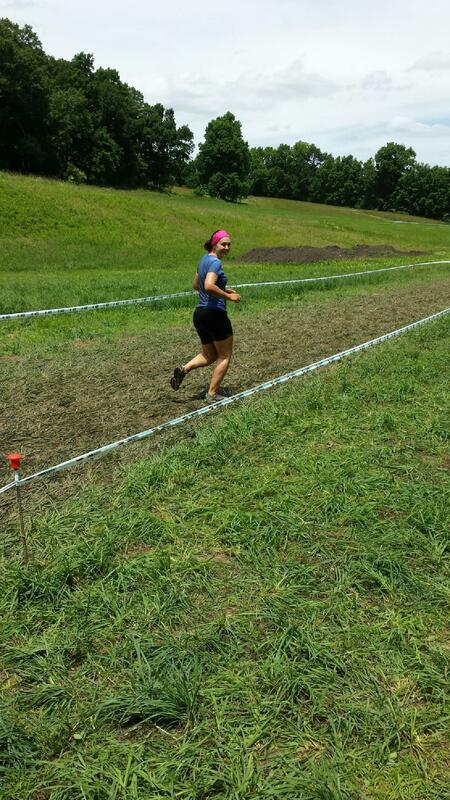 During the race I heard some people complain that the mud smelled and whatnot, which I thought was kind of silly. 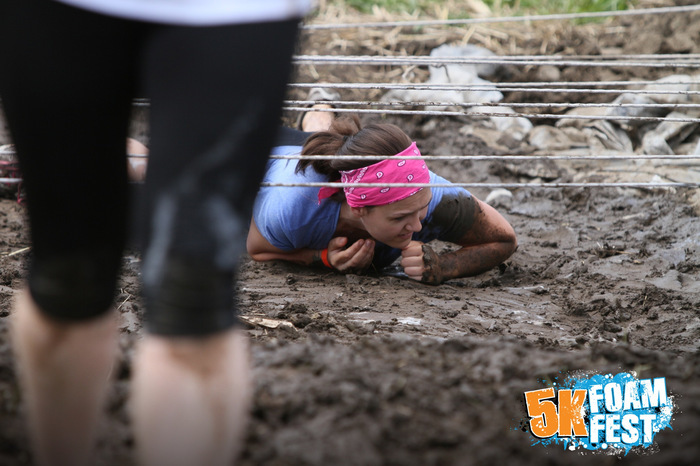 It is in part a mud run, after all, and that’s how mud smells! Then again this is coming from the girl who loves barns and cleans up after horses, so I’m not sure. The poor people organizing the New England Foam Fest, however, ran into problems with the town of Haverhill last minute and were told that they could not provide on-site parking for participants in the race. Ultimately, that meant that participants and spectators had to park at an abandoned greyhound racing track in Seabrook New Hampshire and take a “15 minute” (it was really 20-25 minutes) drive to the race site on a school bus. As you may imagine, this proved problematic during an event with thousands of participants. The lines for the shuttle were extraordinarily long, and I estimate that the shuttle ride plus the wait for the shuttles to and from the race site added an unexpected two hours to the total time I spent on this adventure. Unfortunately, the people at 5k Foam Fest really didn’t have too much of a choice – it is just unfortunate that this controversy with the town had to happen a mere 2 weeks before the event. 5k Foam Fest also issued a public apology via their Facebook page for the confusion. That said, this was honestly the only thing that I was bummed about. The race itself, once all was sorted out, was awesome. The helpfulness and flexibility of the staff on this undoubtedly stressful day for them also did not go unnoticed – they let me join a later wave with a smile when I (along with at least half of the other participants) arrived too late for my original assigned “wave” due to the transportation issues. The 5k Foam Fest surprised me, but in the best of ways. Though free entry was awesome for me as a broke student, none of my other broke student friends could afford to drop $75-90 on the entry fee, so I was forced to do the race alone. Most people, understandably, did the race with a team or at least a buddy or two, so I was not looking forward to going it alone. 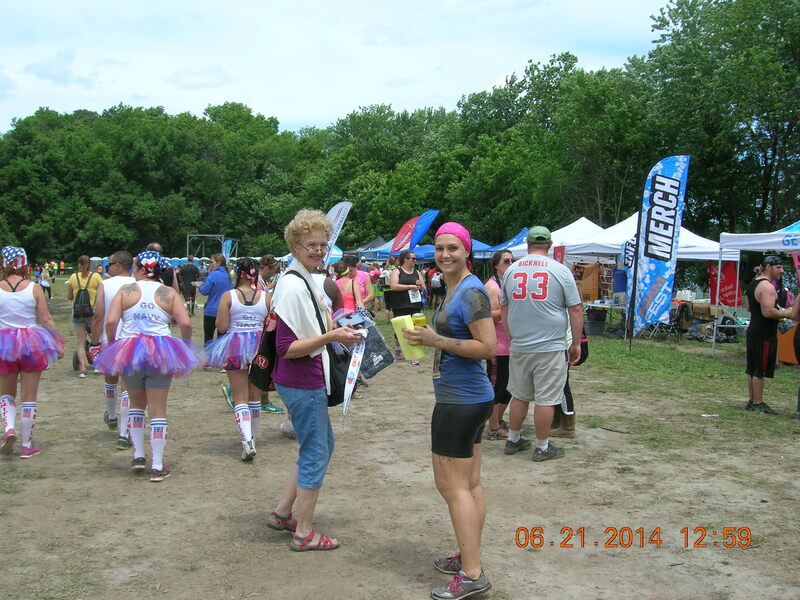 To my delight, the race was so much fun that I didn’t even mind that I wasn’t part of a tutu-wearing team! Going stag was not an issue in a race devoted to fun, community, and healthy challenges. I smiled and laughed my way through the course. The event is publicized largely as an athletic, but mostly just fun experience. I would agree that the race is more about fun, community, and laughter than simply athleticism. 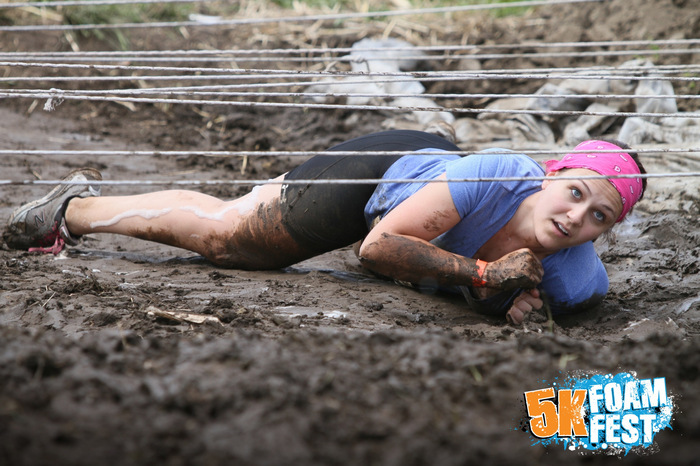 That said, it was still a physical challenge – I have the scratches and bruises to prove it! The course itself was quite hilly in parts, and like all other types of trail running, was much more strenuous than a road race (though easier on the joints, I suppose). Virtually everyone, including myself, ran-walked the course – the steep hills and injection of various obstacles at different points throughout the course really made it necessary. 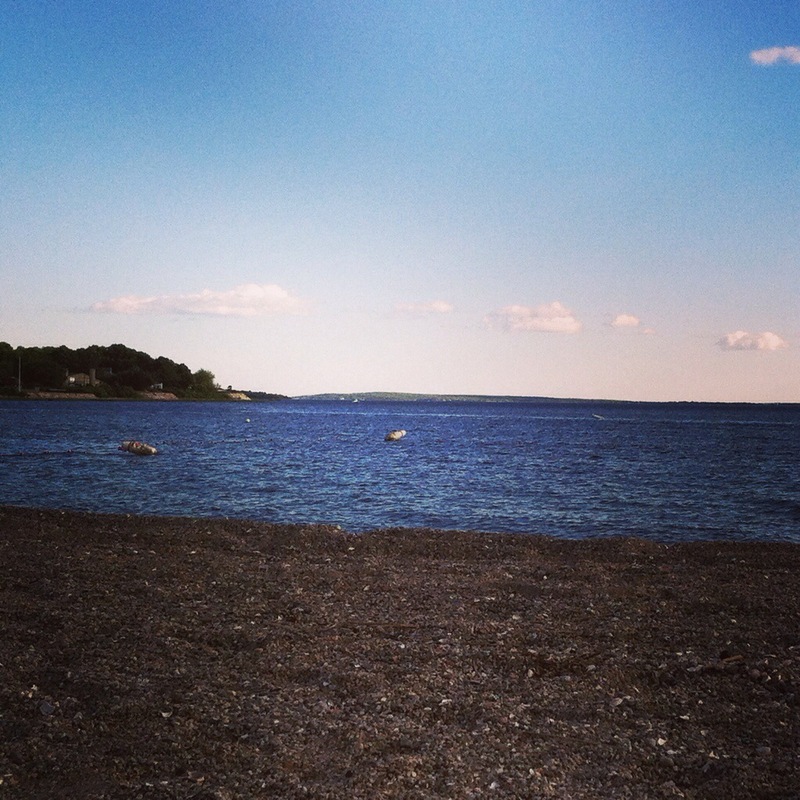 I did end up running most of it, however – those hill workouts paid off! 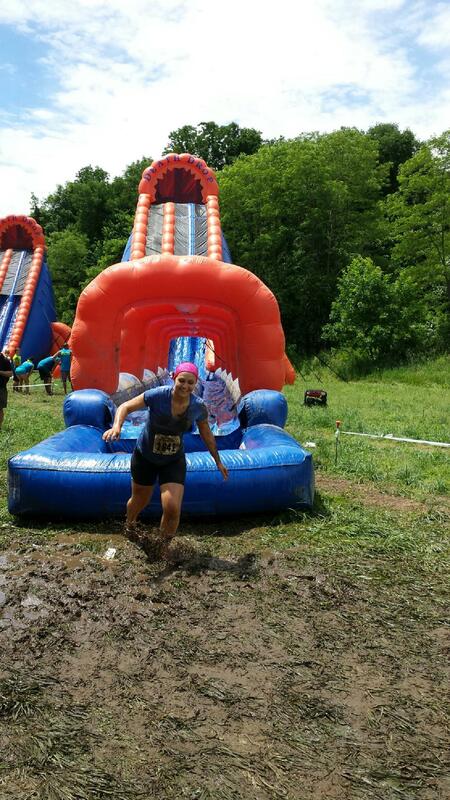 The obstacles varied widely, but each one was totally fun. 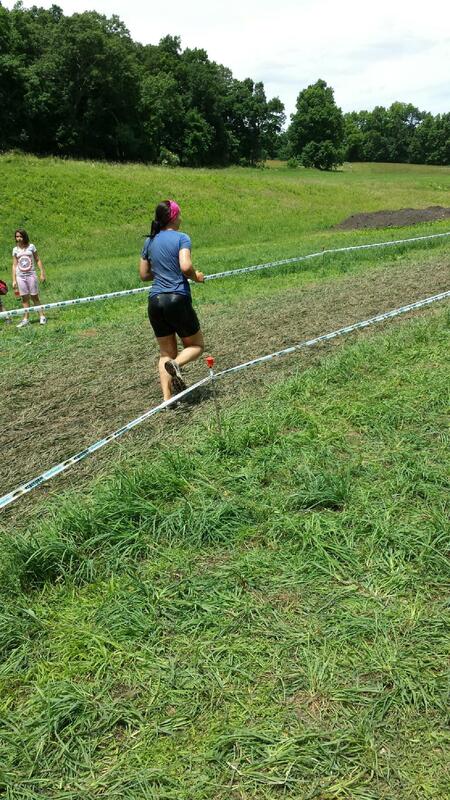 Honestly there was not a single obstacle that I did not enjoy. In fact, I might have actually enjoyed what appeared to be one of the least popular obstacles – the ascending cargo net climb. I was really into the ropes-heavy obstacles, as I love climbing things and have done some rock climbing in my day. For a number of others, this appeared to be a big source of anxiety! I myself am ever so slightly afraid of heights, but I promise that this obstacle is nothing to be afraid of. I highly doubt it would even be possible to truly fall – it seems to me you would just get tangled in the net if you lost your footing. 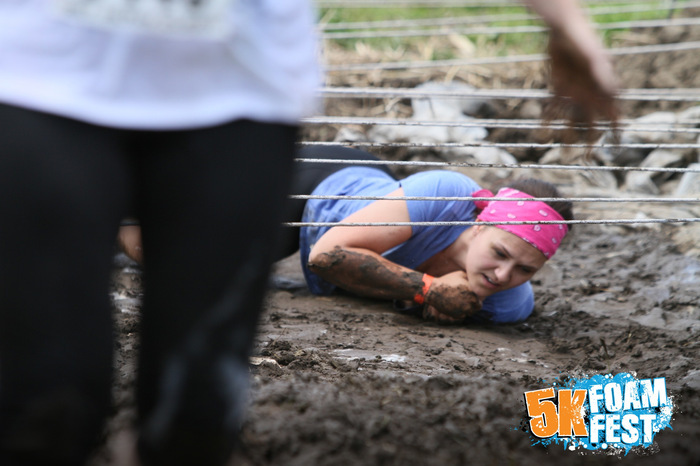 Best of all was the fact that these muddy, dirty obstacles (I’m looking at you, army crawl under ropes!) were followed up by bursts of foam. 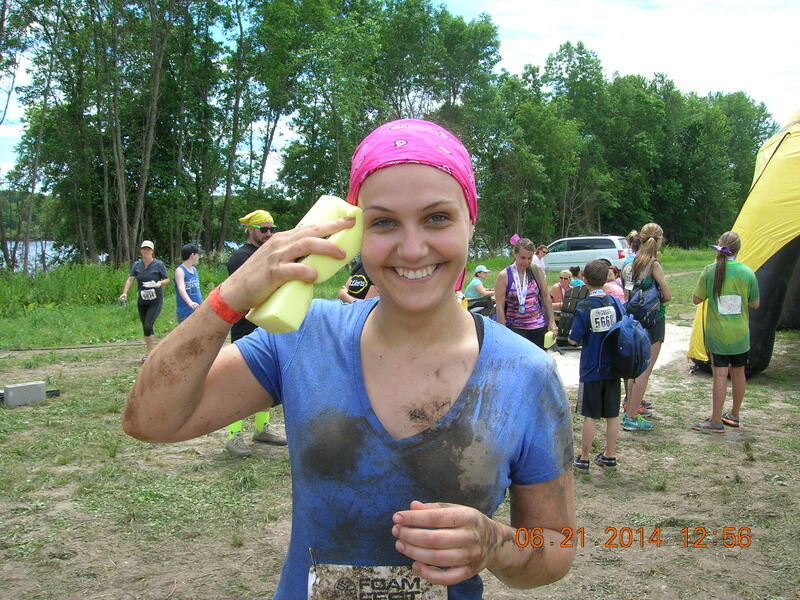 At one point I was caked with mud and then with foam – I likely looked like I had been tarred and feathered. 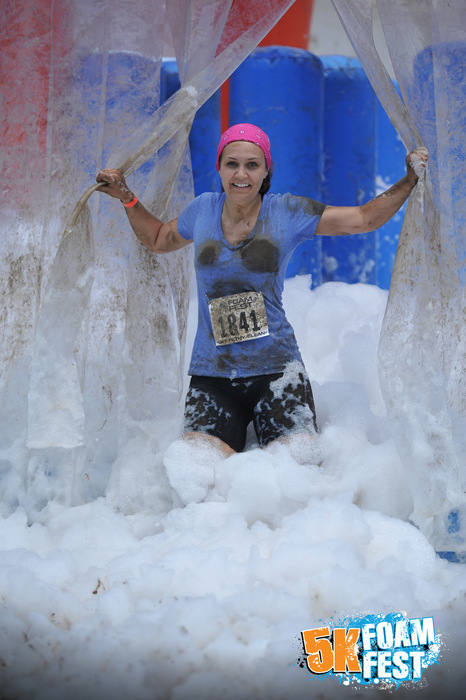 5k Foam Fest also set up professional photographers at nearly each obstacle on the course – another awesome perk! They will be sending out high quality photos to runners soon. I imagine with the huge number of participants that such a task will take some time! My parents were so excited that they didn’t really seem to understand that it was a race and that I actually still had to run the rest of it, and that it wasn’t actually a photo shoot. Whoops! My parents trying to pretend I’m a fitness model or something. 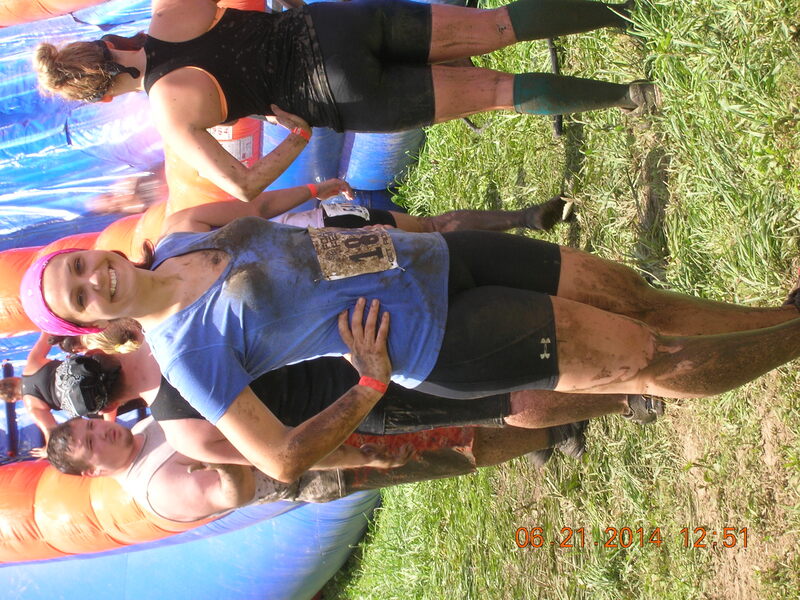 Soaked, muddy, and pushing for the finish! Unfortunately I couldn’t stay for too long after the race because, as I mentioned earlier, everything took WAYYY longer than expected and I had to get to work in the early evening! The event was fun and cute, though, and immediately after crossing the finish line the staff gave us protein bars, water, our finisher medals, and directed us in line to our t-shirts. That was really well-organized and convenient – the transition was seamless and really appreciated, as I was hungry and thirsty and didn’t know where to go! They also handed out giant sponges courtesy of Mike’s Hard Lemonade, one of their primary corporate sponsors. Admittedly this form of advertising was highly useful considering how muddy I was. I also got my choice of Mike’s Hard – appreciated after all that! All in all, a really great time. I would definitely recommend this race to anyone that was interested! It is suitable for a variety of fitness levels, but anyone who wishes to compete should definitely work on some strength training even if they plan on walking the course in its entirety. And for the broke students and such out there – don’t be too scared off by the price tag! There are always coupons. In fact, I have a coupon code for you right here! Use my personal code “FF3316” to get $5 entry at any race location across the U.S. 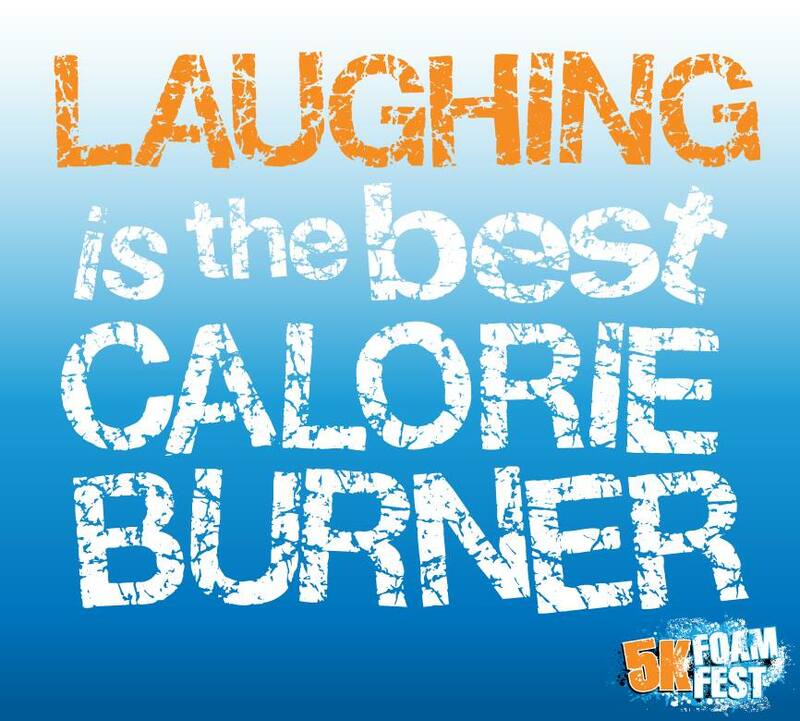 In the meantime, from the folks over at Foam Fest, I leave you with this fitness tip. I’ve been desperately busy this week starting another part-time summer job as a hostess in a seaside restaurant (beach time before work hopefully! 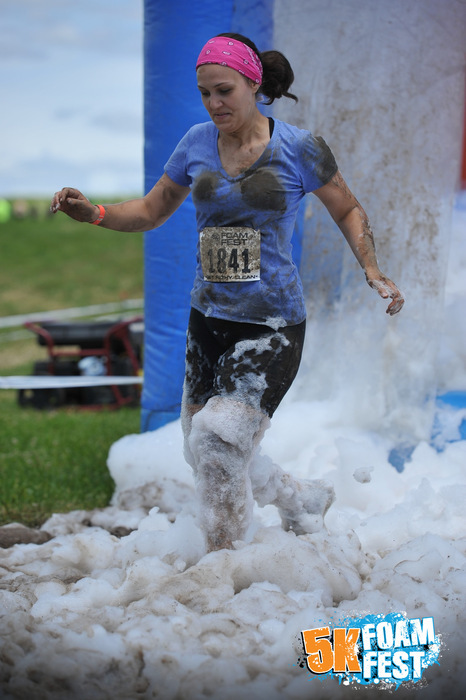 ), but I should get a little more breathing time soon to write a review of the 5k Foam Fest that I am participating in TOMORROW! Very, very excited. Should be a really fun time! Totally need this list right now – “25 Small Things You Can Do To Make The World A Kinder Place” via Lorna Jane’s amazing Move Nourish Believe site. It has been a long day and I am exhausted emotionally and physically! I just found out that I am being further waitlisted at Cornell Law, which is really frustrating and puts me in a very uncomfortable predicament regarding potential housing. *Sigh*. Nothing I can do about it right now. I think I’m just going to turn in early and get in some good zzz’s while I can. Sleep heals all! 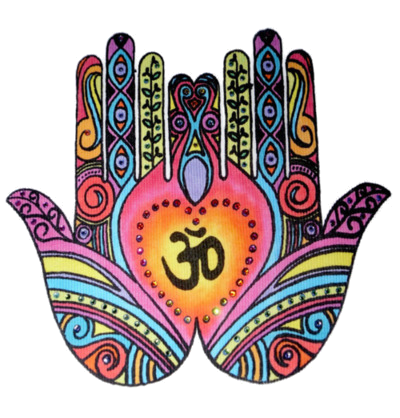 find of the week – great online yoga classes! We thought that we’d have enough time to get to the gym in the evening. We didn’t realize that the local yoga studio was closed for the day. We just can’t bring ourselves to go out for that run or walk on this rainy day. Enter the at-home workout. If you’re like me, you’d much rather be in the yoga studio or at the gym or outside. But sometimes life just gets in the way. So yesterday when I wanted to make a community yoga class and found that the class had been cancelled (no Father’s Day yoga, I guess! ), I was pretty bummed. But then I found a gold mine: DoYogaWithMe.com. I’ve been able to comb through the site, and it’s really nice! The quality of the videos is good, the sound is great, and it’s awesome for someone like me who likes having an instructor/model when I practice. Yesterday I did this short but really effective core workout – highly recommend it! Can’t wait to try out more of their workouts. For all you yoginis short on time and/or money (problems I more than sympathize with!) – these videos are not only convenient, but FREE. That said, you can purchase them if you wish to download them for a reasonable fee, and you can also donate to the project. 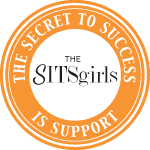 Yoga shouldn’t be exclusive – support awesome folks like this who have tried to make it more accessible! In one week: 5k Foam Fest! Hope everyone had a good week. I have been just chugging along per usual, trying to work and save up money and continuing my training. 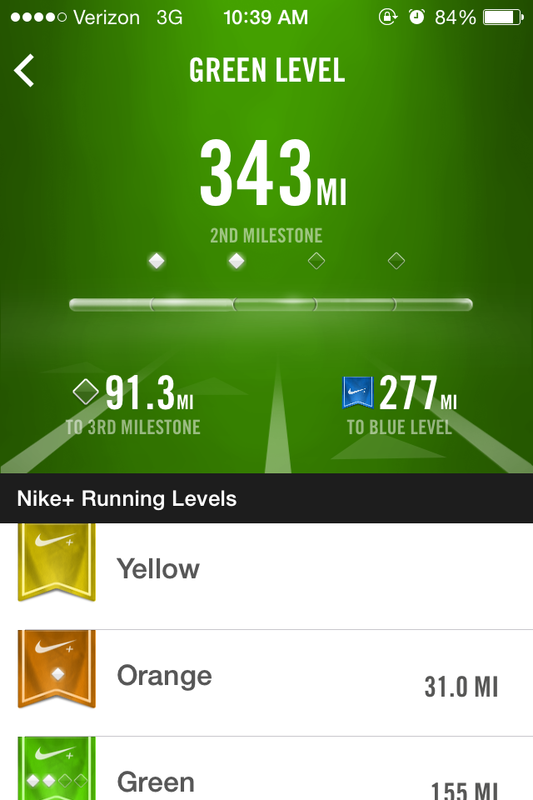 Hit a running milestone with my Nike+ during my hill run earlier this week! 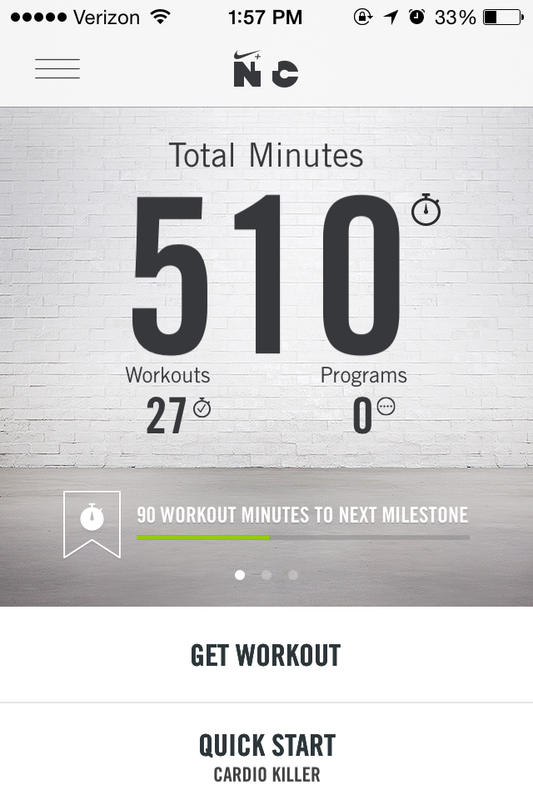 Hit another milestone with my Nike Training Club app. 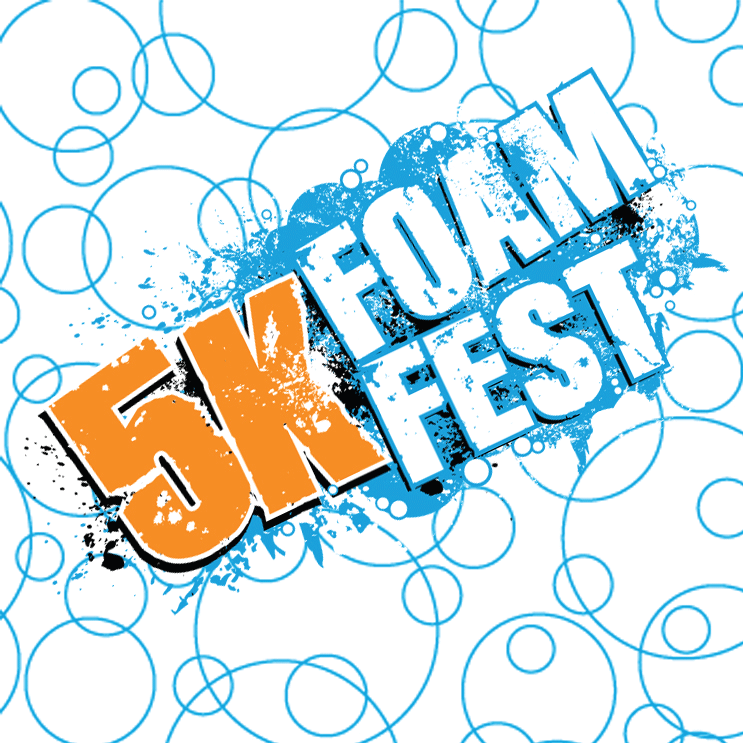 As part of my training, in exactly one week, I will have the opportunity to enjoy the 5k Foam Fest in Haverhill, MA! Apparently, there was a rumor going around that the event would no longer be held or would be switching locations – this is false! The event will still be happening next Saturday in Haverhill. In fact, you can use the code “HERETOSTAY” if you decide to register last-minute for the New England 5k Foam Fest! Otherwise, use my personal code “FF3316” to get $5 off the race at any location! I really, really look forward to the race – should be super fun! In the meantime, I’m going to keep it slow and steady with this race, taking life one step at a time. Just like Tina Belcher. Hope you all had a great weekend – I know I did! I’m so, so glad that the weather out here was so nice. Happy to be able to go outside and soak up some sun! Another great thing about this increase in me time is that now I have more time to prepare and pick out good food! On Saturday a friend and I went to the Providence farmer’s market and browsed through the delicious local goods there. I came home with local pickles (ate the entire jar already), assorted macarons, and some delicious ginger chèvre for my family. Definitely plan on going back next weekend! I love love LOVE picking up fresh food and cooking – having more time to breathe means rekindling my love for cooking/baking/food prep! 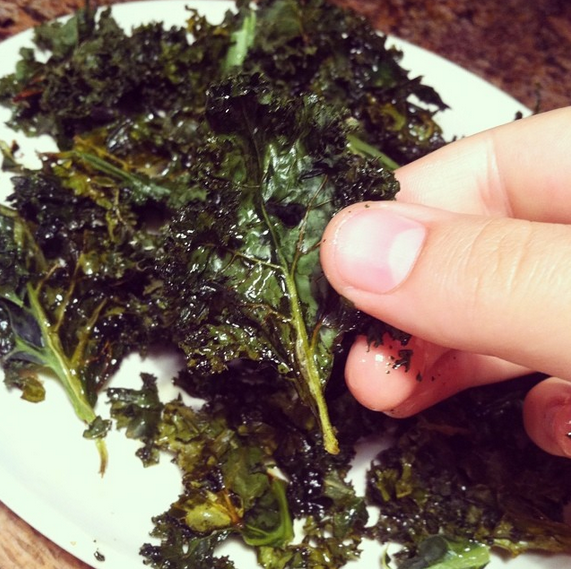 Kale chips! Will definitely be making (and rapidly eating) these all summer. In addition to enjoying sunshine and fresh produce, I’ve continued with my training for the 5k Foam Fest and of course August’s Tough Mudder. A friend of mine wants to run a 5k together (we ran our first race together a year or so ago this summer! ), so I might add in another event somewhere in there, too. 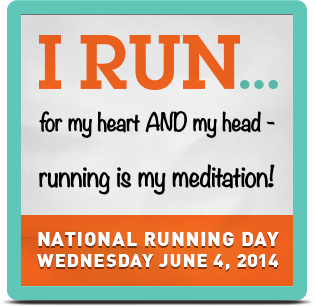 I’m also looking to run longer distances in my training for TM, so I was considering doing another longer race too. There is a 10 miler in Newport this summer, but right now I’m on the fence about signing up. We’ll see! If I can get someone to do it with me I’d be more eager to register. I think it might help break up my training, but don’t want it to be another source of anxiety. In addition to my time at the gym and on the road running, I’m trying to make more yoga time. My new obsession is finding free or “community” yoga classes – ideal for someone on a student’s budget! And of course who couldn’t use more time on a yoga mat? This is a summer of prep and self-care, that is for sure. This is subject to change, of course. 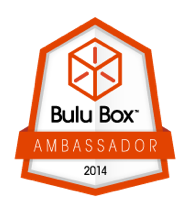 I’m excited but nervous – hope my DIY plan is up to par! 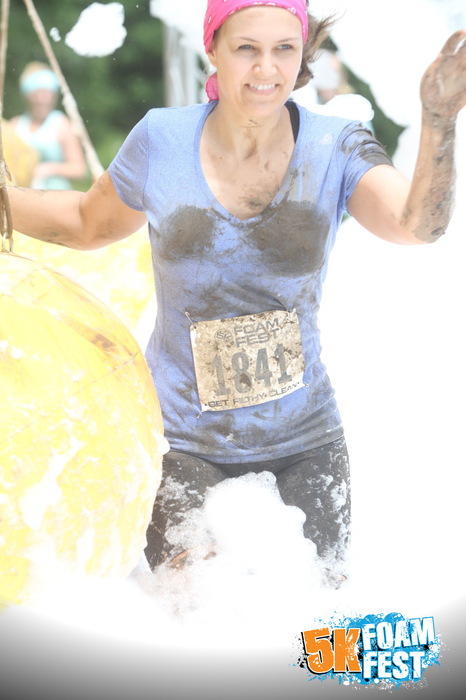 Any former Mudders have any other suggestions/tips for me? Or any other folks knowledgeable in this area? I hadn’t been on a run since not long after my 10k.. yeah. 2+ weeks no running! With the craziness of everything, I haven’t really been working out much at all. This week, the first normal week in a while, I was finally able to get back to a more normal routine and start training again (if you’ll recall, I’ll be doing a Tough Mudder come August). 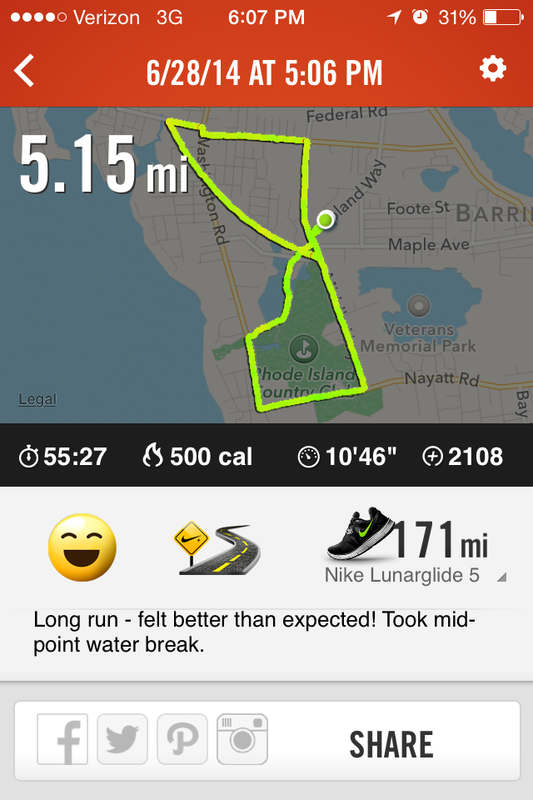 Yesterday, as it was the first day back in a while, was a short run with a friend. It felt less than great during the process (do first runs back ever feel good? ), but post-run I was sweaty and feeling great. I ran again today, this time inside (I don’t like running in the rain! 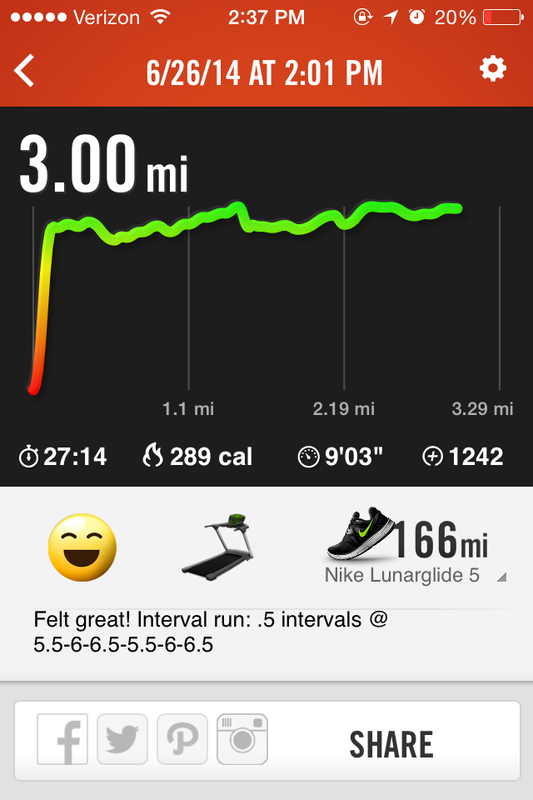 ), and got in a solid 3 miles at a good pace. Felt infinitely better than yesterday! After a bunch of strength-training workouts (upper body on Monday and lower body on Tuesday), the motion of the run actually felt like a massage to my sore muscles. That and some quality time with my beloved foam roller has really helped my aching glutes and thighs. This should be a ridiculously fun way of prepping for my upcoming TM! 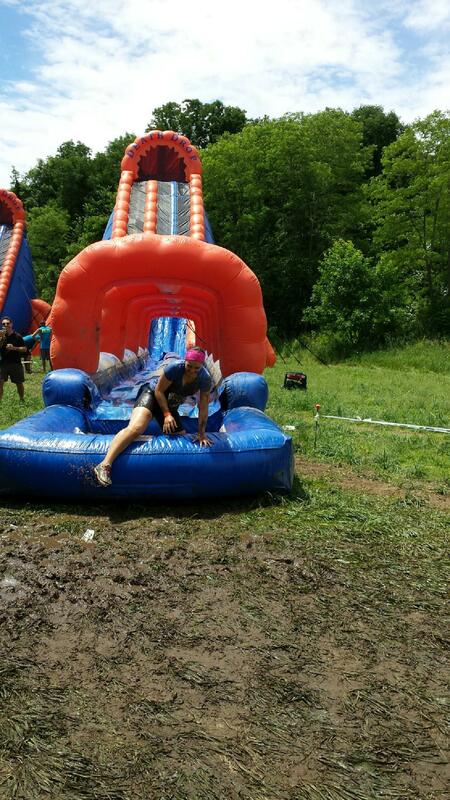 I will be running, climbing, and crawling through their foam-filled obstacle run on June 21st at 10:30 in MA. Come join me! As a Sweat Pink ambassador and a Foam Fanatic, I’ve been given a discount code available to ANYONE. Just enter my unique code “FF3316” at checkout to get $5 off your entry fee to any 5k Foam Fest nearest to you! Do you Know Your Risk for Breast and Ovarian Cancer? Superwoman Lindsay Avner has created an interactive tool at her site BrightPink.org where women can assess their susceptability for breast and ovarian cancer. Incredibly important issue in women’s health today. I applaud her for taking the initiative to try to make a difference in women’s lives – and even save lives! A self-styled superwoman sweating through life in search of balance and prosperity. 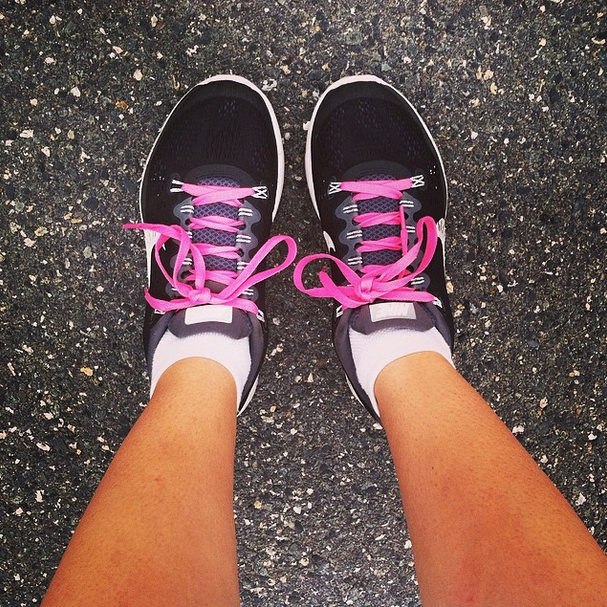 Horseback rider, longtime yogini, nascent runner, but most importantly a survivor. Visit Peace.Sweat.Love. 's profile on Pinterest.